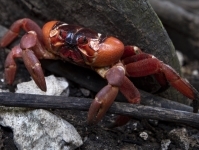 The WASG Christmas Island Expedition 2018, supported by Curtin University and the Ecological Society of Western Australia, aimed to conduct an extensive stygofauna survey of Christmas Island’s subterranean ecosystems through the power of environmental DNA metabarcoding – a new genetic detection technology. Unlike many traditional surveying techniques, eDNA metabarcoding does not require direct contact with organisms and is therefore an ideal alternative method for locating elusive taxa and monitoring biodiversity in difficult-to-survey locations. As such, there is increasing interest in the use of eDNA metabarcoding as a complementary surveying tool in subterranean environments, such as cave systems. Christmas Island is one of Australia’s external territories located in the Indian Ocean and boasts extensive subterranean and submarine ecosystems that are understudied (Humphreys 2014), making it an ideal location to test the utility of eDNA metabarcoding for surveying stygofauna. In assistance to Katrina West, a Curtin PhD student whose research focuses on the development of this technology, water and sediment samples were collected from 23 sites, including within caves and surface springs, across Christmas Island. These samples were then transported back to Curtin University, Perth to undergo further laboratory processing and determine, through the DNA present in the samples, what types of stygofauna inhabit these subterranean ecosystems. In addition, water parameters such as pH, temperature, conductivity, salinity, air saturation and dissolved oxygen were also measured on site, to determine if the community composition of stygofauna at various sites corresponds to these measures. The project aims to further develop and give prominence to the use of eDNA metabarcoding for subterranean surveying. Some call them crazy, some call them intrepid, we simply call them the cavers on the pre-UIS Conference trip to Magaret River. Thanks to Tim for the preconference images at Margaret River and Marcos for some at the conference. In 2006, there was a break-in at Crystal Cave (the show cave in Yanchep National Park) and a number of the speleothems were broken or removed. Norm Poulter of SRGWA carefully mapped where the various broken parts were found before they were gathered up. Acting on information received, the police retrieved the stolen stals and charged the culprit. Two years or more of legal wrangling followed, in the course of which the caving clubs were asked to place a monetary value on the damaged formations. Despite the impossible nature of this request, we did our best to provide appropriate information. Eventually, the vandal received a 200-hour community work order – a disappointing result from a caver’s perspective. Only then were the cavers free to attempt some rectification of the damage. 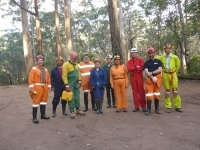 Norm Poulter organised the first part of the job, and Ian Collette of WASG took over the work when Norm moved to Tasmania. In 2016, a grant made available to Dr W.F. (Bill) Humphreys of the W.A. Museum allowed him to organise an expedition to Cape Range to expand an already long running project looking at the genetic data of the cave invertebrates. Up until 2016 the small amount of funds available only allowed him to focus on one main group, the blind millipedes of the genus Stygiochiropus. These millipedes have revealed an interesting distribution of genes into provinces whereby populations are isolated or semi-isolated from each other by natural barriers such as gorges. 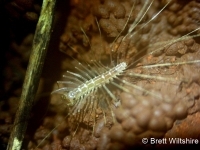 On this trip the aim was to collect specimens from other families of troglobites (animals obliged to dwell within the cave environment) such as Schizomida (micro-whip scorpions), pseudoscorpions (not particularly closely related to real scorpions, although they bear a distinct similarity), cave spiders, isopods (commonly known as woodlice) and etc. 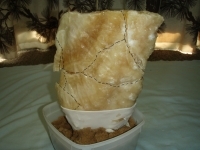 The trip was very successful with many specimens collected from a variety of caves ranging from shallow pits a few metres deep to caves over 50 m deep and many hundreds of metres in horizontal extent. It may take several years for the data from the specimens to be processed and to reveal its many secrets, such as degree and time of divergence from other populations, and in fact whether the divergence actually mimics that of the millipedes. The participants were Dr Humphreys, his assistant Julianne Waldock, both from the W.A. Museum and WASG members Luana Dwyer, Fran Head, Ian Collette, Brett Wiltshire and Darren Brooks.